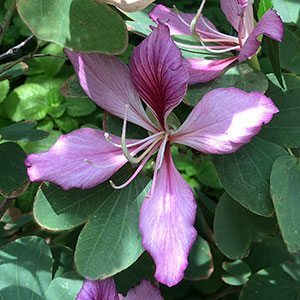 Flowering from spring through to early summer Bauhinia Purpurea is commonly called the Purple Orchid Tree. In warmer climates, the flowering season can be almost year round. It is an evergreen tree, however it will drop some foliage in cool climates and can be deciduous in some colder areas. and grown for the masses of perfumed flowers. The flowers are followed by large seed pods, and the seeds can be collected for propagation. Sometimes called the ‘Hong Kong Orchid’ although this is thought to be a hybrid between Bauhinia purpurea and B. blakeana and has deeper pink to purple flowers. Best in a slightly alkaline soil, humus rich and with good drainage. Once established they do resent root disturbance so transplanting can be difficult. Growth rate – Moderate in good conditions. Flowers – Large purple and fragrant.